Here’s a roundup of what went down in Nigeria entertainment industry for the last week of 2017. It was a week of reconciliation and concerts for Nigerian artistes as they rounded up the year 2017. Nigerians got many shake ups during the week with likes of Davido, Wizkid, Olamide and Mo’hits topping headlines. 1.Nigeria Top artistes Davido and Wizkid reconciled at#Wizkidtheconcert after long term rift all through the year. Wizkid also returned the favour as he performed with OBO crooner at 30billion concert. 2.Mo’hits crew on Wednesday reunited on stage after five years at Davido’s 30billion concert. Davido revealed that it took him two months to unite the crew. 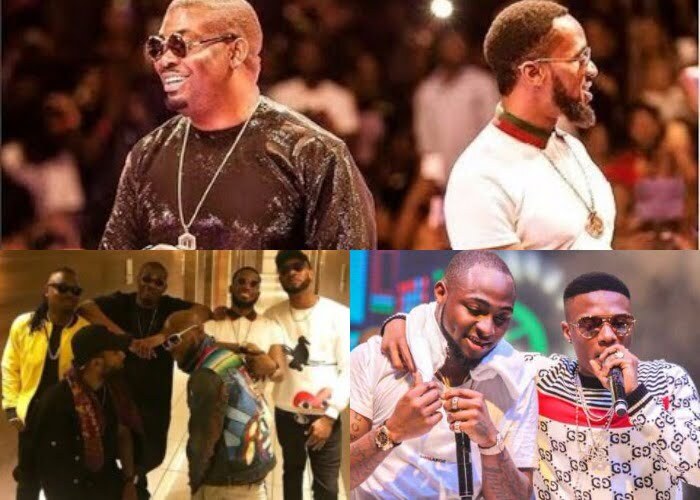 The Mo’Hits crew comprising of Don Jazzy, D’Banje, Wande Coal, Dr Sid, K-Switch, Ikechukwu and D’Prince had seperated in 2012 over several internal disagreements. This was after the young boy ‘wowed’ the crowd with his rap performance. 4. OLIC4: Indigenous rapper Olamide was widely criticised by Nigerians for inviting Lagos state assistant commissioner of police Yomi Shogunle to perform at OLIC, which held at the Stadium. Nigerians accused Olamide of being insensitive to plight of the masses following EndSARS movement all over the country. 5. The war of words between Kiss Daniel and record label G Worldwide over termination of seven years contract seems not to be over. This time around G-worldwide countered Kiss daniel’s reason for not attending his father’s funeral in 2015. The management in defence said the singer shunned his father’s funeral because he feared his relatives who were engaged in fetish practices would kill him. Kiss Daniel had said management prevented him from going for the funeral.